Painting is one of the quickest ways to transform a space and yet, it’s probably one of my least favorite home improvement jobs. I think maybe part of the problem is that I was always using the wrong painting tools. Purdy was kind enough to send me a Prep & Paint Kit and I quickly honed in on the 6-in-1 Painters tool. There are lots of different versions of this tool available but really, the 6-in-1 is all you need. If you’ve ever used one of these, you know how versatile they can be and it’s always nice to have one in your back pocket. The front edge is a sharp scraper that’s perfect for removing paint flecks, glue and even wood. The blade can even be re-sharpened after it begins to dull. Great for spreading putty or joint compound. The short, flat side is perfect for prying. You can use it to open paint cans or remove the bolts from the door hinge. You might be wondering about the purpose of this feature- I did at first. Have you ever tried to clean a roller well enough to reuse it? Well the half circle is designed to squeegee away paint from the roller. The handle incorporates nail set ends for setting drywall nails and other hammering jobs. The pointy end is great for digging out putty or scoring dried paint. You can pry up staples or open up cracks for patching. I’ve used it for removing caulk and it works like a charm. The Purdy 6-in-1 Painters Tool includes all these features, plus a no slip grip handle. 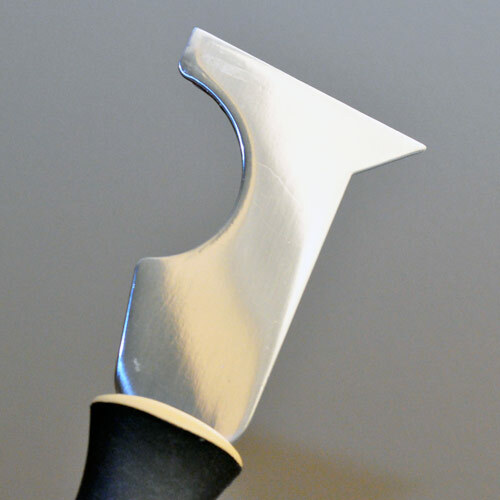 The blade is high-carbon, stainless steel and available is several different sizes. 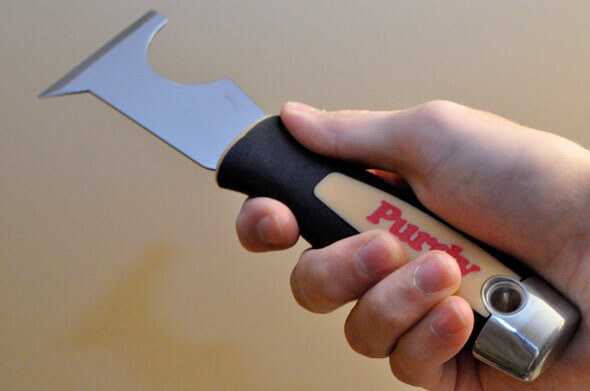 Purdy painting tools are available at lots of home improvement centers. Click here to locate a distributor near you. What do you think? What’s your favorite painters accessory. Even though these are considered painters tools, they are useful for so much more. This tool has earned a place in both my toolbelt and tool box. A tool I don’t leave home without. My favorite painting only tool would be a Pro-Extra extension pole by Purdy.Much less hand cramping than those skinny wooden poles for me, although at a slight weight penalty. I find it so much easier to paint walls with a pole. much less bending up and down. The 4-8 foot version is my go to pole as with just 1′- 2′ extended, I can paint an 8′ ceiling very comfortably and fully extended it works great for up to 12′ ceilings. Another often overlooked tool is a brush spinner. No better way to clean rollers and brushes. @Putnam, I’ve actually never used a brush spinner before but I’ve heard they work really well. I agree with the extension pole too. They let you work so much faster. I LOVE the 6 in 1 paint tool from Purdy!! !